In 1947, George Soros emigrated from Hungary to England, where an event occurred that greatly influenced the development of George's personality and worldview. He broke his leg and was cared for by England's National Health Service, free of charge, while the Jewish relief agencies of that era did not offer him the help he believed they owed him. In that event was born Soros' favorable opinion of Democratic Socialism, and his negative view of many Jewish groups. George Soros, who is an atheist, said in a June 1993 interview with The Independent that he saw himself as “some kind of god, the creator of everything.” Two years later, he portrayed himself as someone who shared numerous attributes with “God in the Old Testament” ― “[Y]ou know, like invisible. I was pretty invisible. Benevolent. I was pretty benevolent. All-seeing. I tried to be all-seeing.” Soros told his biographer Michael Kaufman that his “goal” was nothing less ambitious than “to become the conscience of the world” by using his charitable foundations. In late March of 2002 Soros announced he was giving three million dollars to Budapest Open Access Initiative to set up open-archiving systems. Soros was accused of "foolishly spending millions [to] undermining libraries, librarians, authors and referees". Soros personally has made campaign contributions to Democrat political candidates; Barack Obama, Hillary Clinton, Charles Rangel, Al Franken, Tom Udall, Joe Sestak, and Sherrod Brown. During the 2004 election, George Soros donated $23,581,000 to various liberal 527 Groups dedicated to defeating President George W. Bush. Soros contributed $3 million to the leftist propagandist Center for American Progress and $5 million to radical leftist MoveOn.org. He was the founder of the Open Society Institute. George Soros has personally expressed a strong disliking of President Bush. In 2004 he stated defeating Bush was "the central focus of my life," and "a matter of life and death." He also said "America, under Bush, is a danger to the world" and claimed "[Bush] is undermining American values". He says he "been demonized by the Bush campaign" and donated more than 15.5 million in a failed attempt to defeat Bush in 2004. In 2004, Soros held a Barack Obama fundraiser for his campaign in the U.S. Senate. Obama visited Soros office in New York, December 2006. January 2007, Obama started to campaign for the presidency. Within hours of announcing his candidacy, Soros had donated the maximum allowed by law to the Obama campaign. Soros has visited the White House at least four times in 2009 and has influence with other frequent White House visitors. Soros and members of his family contributed a total of $60,000 directly to Obama. While the rest of the world financial markets were losing billions of dollars, Soros made billions of dollars for which he said, [he's] "having a very good crisis." Some people speculate that Soros was responsible for the crisis by removing his large sums of money from institutions and betting against currency valuations. 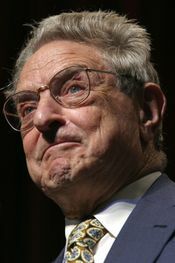 Other leftist groups Soros funds includes the following;  the American Constitution Society for Law and Policy, the Tides Center; the National Organization for Women; Feminist Majority; the American Civil Liberties Union; People for the American Way; Alliance for Justice; NARAL Pro-Choice America; America Coming Together; Campaign for America's Future; Amnesty International; the Sentencing Project; the Center for Community Change; the National Association for the Advancement of Colored People Legal Defense and Educational Fund; Human Rights Watch; the Prison Moratorium Project; the Malcolm X Grassroots Movement; the National Lawyers Guild; the Center for Constitutional Rights; the Coalition for an International Criminal Court; The American Prospect; MoveOn.org; Planned Parenthood; the Nation Institute; the Brennan Center for Justice; the Ms. Foundation for Women; the National Security Archive Fund; the Pacifica Foundation; Physicians for Human Rights; the Proteus Fund; the Public Citizen Foundation; the Urban Institute; the American Friends Service Committee; Catholics for a Free Choice; Human Rights First; the Independent Media Institute; MADRE; the Mexican American Legal Defense and Education Fund; the Immigrant Legal Resource Center; the National Immigration Law Center; the National Immigration Forum; the National Council of La Raza; the American Immigration Law Foundation; the Lynne Stewart Defense Committee; and the Peace and Security Funders Group. According to Connie Bruck of The New Yorker, George Soros told her that "I don't deny the Jews their right to a national existence — but I don't want to be part of it." According to Joshua Muravchik, Soros has publicly likened Israel to the Nazis. According to the Jerusalem Post, "Soros and his wealthy Jewish American friends have now decided to aim their fire directly at Israel . . . to form a political lobby that will weaken the influence of the pro-Israel lobby AIPAC." George Soros is a Hungarian-born Jew who escaped the Holocaust by going to London as a child. Soros has blamed Europe's anti-Semitism as a result of policies created by the United States and Israel, saying "There is a resurgence of anti-Semitism in Europe. The policies of the Bush administration and the Sharon administration contribute to that." Abraham Foxman, national director of the Anti-Defamation League, called Soros's comments “absolutely obscene". Soros has called for a "regime change" in the United States has spoken of funding projects in Palestine. He is often criticized by the Jewish community for failing to give funding to their causes. In September 2002 Soros's Open Society Institute gave $20,000 to the Defense Committee of lawyer Lynne Stewart who defended terrorists in court and was sentenced to 28 months in prison for "providing material support for a terrorist conspiracy". ↑ 16.0 16.1 The World According to Soros. Retrieved on 2007-10-04. ↑ 17.0 17.1 Soros's Deep Pockets vs. Bush. Retrieved on 2007-10-04. ↑ 27.0 27.1 In rare Jewish appearance, George Soros says Jews and Israel cause anti-Semitism. Retrieved on 2007-10-05. ↑ 28.0 28.1 George Soros Blames Jews for Anti-Semitism. Retrieved on 2007-10-05. ↑ 30.0 30.1 30.2 30.3 Buying Political Power. Retrieved on 2007-10-04. This page was last modified on 30 April 2014, at 11:51.